Interactive 3D brains in PDF documents | Brainder. A screenshot from Acrobat Reader. The example file is here. Would it not be helpful to be able to navigate through tri-dimensional, surface-based representations of the brain when reading a paper, without having to download separate datasets, or using external software? Since 2004, with the release of the version 1.6 of the Portable Document Format (PDF), this has been possible. However, the means to generate the file were not easily available until about 2008, when Intel released of a set of libraries and tools. This still did not help much to improve popularity, as in-document rendering of complex 3D models requires a lot of memory and processing, making its use difficult in practice at the time. The fact that Acrobat Reader was a lot bloated did not help much either. Now, almost eight years later, things have become easier for users who want to open these documents. Newer versions of Acrobat are much lighter, and capabilities of ordinary computers have increased. Yet, it seems the interest on this kind of visualisation have faded. 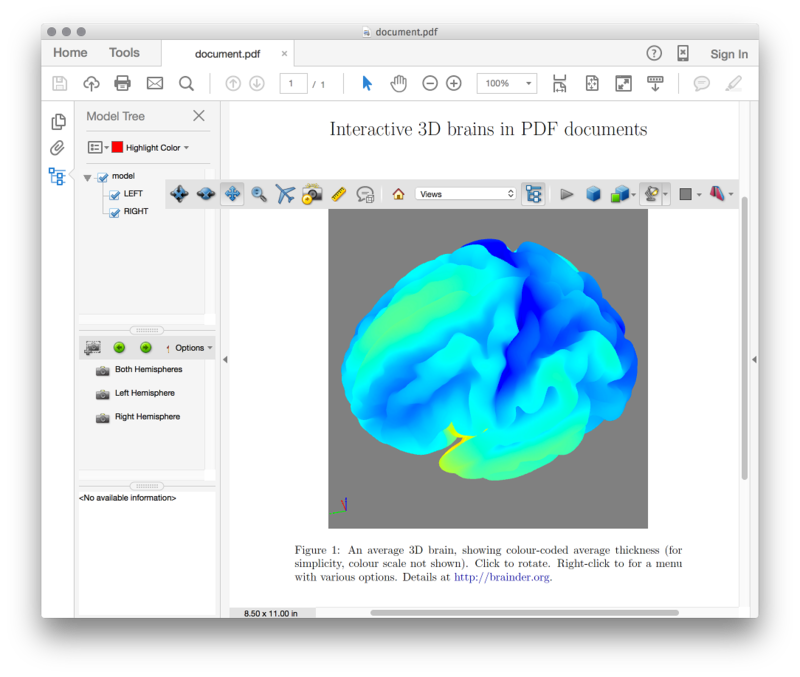 The objective of this post is to show that it is remarkably simple to have interactive 3D objects in PDF documents, which can be used in any document published online, including theses, presentations, and papers: journals as PNAS and Journal of Neuroscience are at the forefront in accepting interactive manuscripts. The ply2idtf function: Make sure you have the latest version of the areal package, which contains the MATLAB/Octave function ply2idtf.m used below. Certain LaTeX packages: The packages movie15 or media9, that allow embedding the 3D object into the PDF using LaTeX. Either will work. Below it is assumed the older, movie15 package, is used. Once you have a map of vertexwise cortical data that needs to be shown, follow the instructions from this earlier blog post that explains how to generate Stanford PLY files to display colour-coded vertexwise data. These PLY files will be used below. The first argument is a cell array with 3 columns, and as many rows as PLY files being added to the IDTF file. The first column contains the file name, the second the label (or node) that for that file, and the third an affine matrix that maps the coordinates from the PLY file to the world coordinate system of the (to be created) U3D. The second (last) argument to the command is the name of the output file. Here we use the older movie15 LaTeX package, and the same can be accomplished with the newer, media9 package. Various viewing options are configurable, all of which are described in the documentation. These options can be saved in a text file with extension .vws, and later supplied in the LaTeX document. An example is below. Interactive, 3D viewing is unfortunately not supported by most PDF readers. However, it is supported by the official Adobe Acrobat Reader since version 7.0, including the recent version DC. Thus, it is important to let the users/readers of the document know that they must open the file using a recent version of Acrobat. This can be done in the document itself, using a message placed with the option text of the \includemovie command of the movie15 package. A minimalistic LaTeX source is shown below (it can be downloaded here). After generating the PDF, the result of this example is shown here (a screenshot is at the top). It is possible to rotate in any direction, zoom, pan, change views to predefined modes, and alternate between orthogonal and perspective projections. 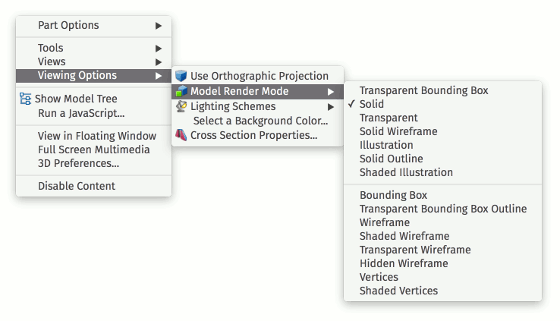 It’s also possible to change rendering modes (including transparency), and experiment with various lightning options. In Acrobat Reader, by right-clicking, a menu with various useful options is presented. A toolbar (as shown in the top image) can also be enabled through the menu. The same strategy works also with the Beamer class, such that interactive slides can be created and used in talks, and with XeTeX, allowing these with a richer variety of text fonts. Wikipedia has an article on U3D files. Alexandre Gramfort has developed a set of tools that covers quite much the same as above. It’s freely available in Matlab FileExchange. To display molecules interactively (including proteins), the steps are similar. Instructions for Jmol and Pymol are available. Commercial products offering features that build on these resources are also available. This entry was posted in File types, Rendering, Scripts and tagged 3d model, blender, brain, idtf, LaTeX, media9, movie15, pdf, stanford ply, surface, u3d by A. M. Winkler. Bookmark the permalink.